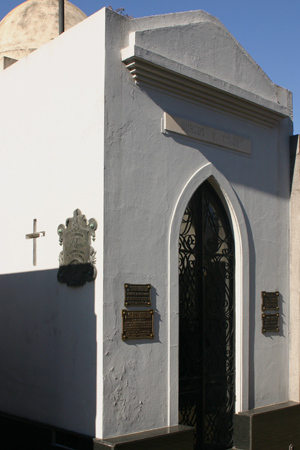 Although plain & simple by Recoleta standards, this family vault contains two of the greatest surgeons in Argentine history. 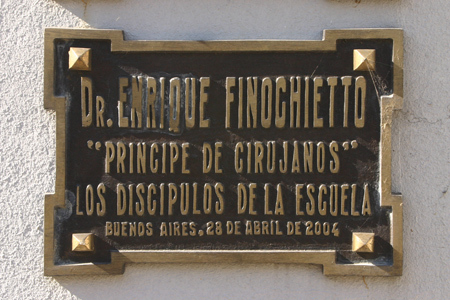 Enrique Finochietto entered medical school in Buenos Aires at the age of 16 & earned his degree with honors in 1904. After spending some time as a surgical intern specializing in skin & venereal disease, Enrique took his first trip to Europe to learn new techniques, brought them back to Argentina & was named head of surgery at Hospital Rawson. He would not sit still for long. 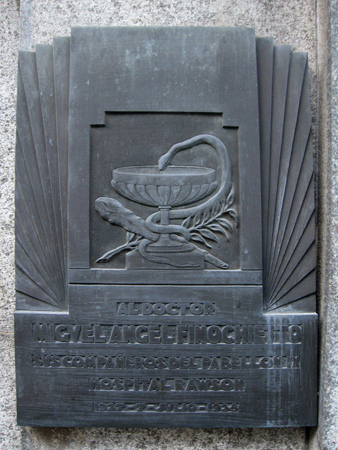 Enrique returned to Europe during World War I, meeting Marcelo T. de Alvear in Paris, where they jointly set up a hospital for the wounded. The French were so grateful that they awarded Enrique the Legion of Honor medal. Returning to Buenos Aires, the Finochietto brothers opened the new, cutting-edge surgical wing of the Hospital Rawson & Enrique began inventing surgical instruments… among them the frontolux, inspired by a miner’s head gear. After a long history of medical accomplishments, Enrique succumbed to syphilis in 1948. Enrique’s younger brother, Ricardo, followed in his footsteps but was more geared toward teaching than inventions. 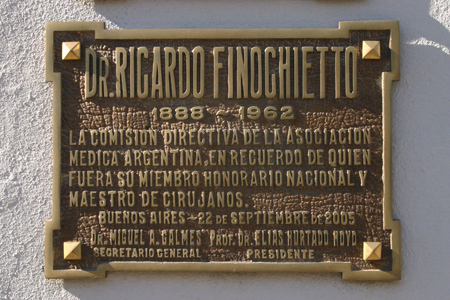 He traveled to the United States in the 1930’s & implented the system of residency in Argentina by establishing a surgical school specifically for recent graduates to improve their technique. 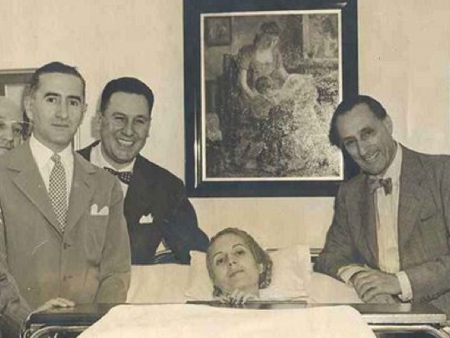 In 1950 while head of the Polyclinic in Avellaneda, Ricardo was designated as Eva Perón’s head physician. With an advanced case of uterine cancer, he could do little to ease Evita’s pain & was present when U.S. surgeon George Pack performed a hysterectomy. In the 1952 photo below, Ricardo appears on the far right. After the Revolución Libertadora which ousted Perón, Ricardo’s ties with the previous administration prevented him from working in the public sphere. He passed away in 1962. What remains unclear is why Enrique & Ricardo Finochietto are in this particular family vault. Since the mausoleum is not in their name, perhaps it belongs to a family member by marriage. Stay tuned for updates! Despite three attempts, I haven’t been able to find this plaque again in the cemetery. 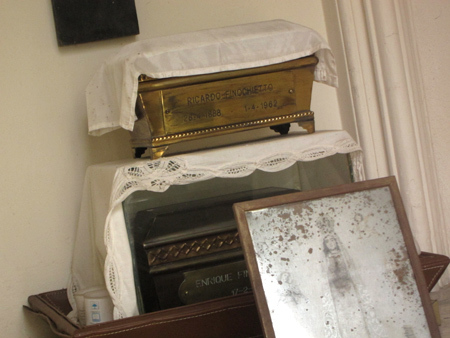 Today, I talked with one of the caretakers in the area where he should be buried (judging from the photos I took before & after) & most likely the vault for Miguel Ángel was recently sold. Still have to confirm with Administración, but it seems likely that he has moved to another cemetery.